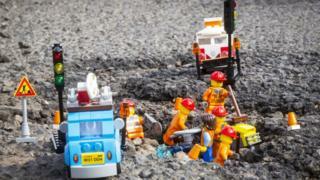 Fixing roads in Wales should be treated as a priority over building new ones, an assembly report has said. It comes after the Welsh Assembly's economy, infrastructure and skills committee launched a photo competition to highlight the state of the roads. The competition's winner, from Wrexham, described the roads in his area as "like driving a beach buggy around". The Welsh Government will now consider the committee's report, which called for a "long-term approach". The winning photograph was taken by Antony Maybury on the A525 near Bronington in Wrexham county. The pothole in question has since been filled in, but Mr Maybury said the potholed roads near him are "horrendous". Wales' road network covers about 21,000 miles (33,800km) and severe weather over the winter of 2017-18 has left local authorities with a backlog of repairs and potholes that need filling. Swansea council says its bill for repairs has reached about £54m. Mark Woodman, managing director of Woodman's Dairy in Cardiff, said staff members had been injured while out on deliveries and said he spends "a couple of thousand pounds" a year on repairing vehicle damage caused by potholes. "It gets worse and worse. One of my staff was injured a few years ago when he actually fell. It was very early in the morning and very dark, he went over in a pothole and obviously carrying glass bottles, he cut himself," he said. "He had to be taken to Morriston hospital in Swansea for an operation. It is a big problem. "They don't actually solve the problem, they just patch over the potholes." The report suggested a "long-term approach" to road maintenance and cited a study by Leeds University which claims it costs "between 17 and 19 times more to do odd fixes rather than doing planned asset management upgrading". It also cited claims by the AA which said as many claims had been made for damage caused by poor road surfaces in the first four months of 2018 as the whole of 2017. Other recommendations in the report include using apps to improve real time data and the Welsh Government topping up additional spending on roads by local authorities. Chairman of the committee, Russell George AM, said: "The everyday things that sustain us, including much of our food, is transported on the roads and keep the economy moving. "There is an overwhelming consensus that long term funding for local government and trunk road agencies would lead to improvements - but we remain stuck in an annual cycle. "We need to act now, and this Committee believes that repairing and improving the network we have right now should be a clear priority over building new roads."